Duplex with 3 bedrooms and 2 bathrooms, with 109 m2 constructed area, located on the second floor of a building with elevator in the Hipercor area. Access to the apartment is through a communal interior patio with lots of light. On the main floor there is the living-dining room –with high ceilings and access to the balcony–, the kitchen with laundry room, a single room and a bathroom. A light staircase communicates with the upper floor, with a wide open distributor, two double bedrooms and the second bathroom. The total useful area is 93.25 m2. 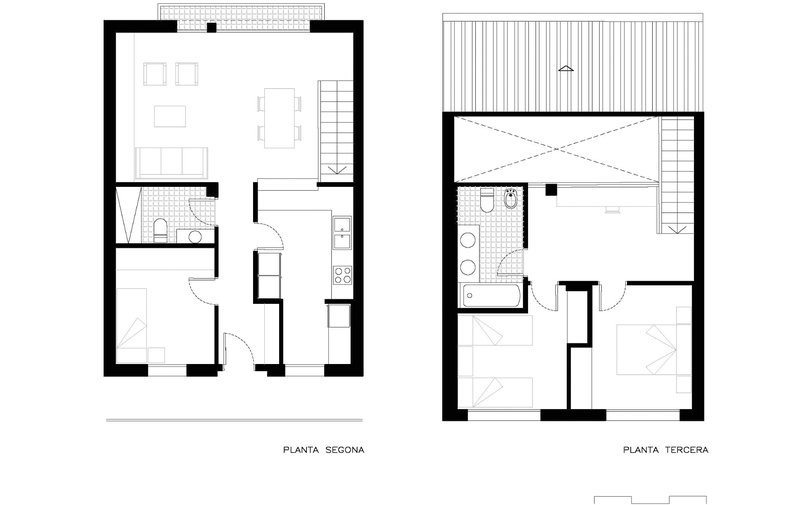 The configuration of the building, through the interior patio, facilitates the cross ventilation of the apartment. The double height of the living room and the light staircase give a feeling of spaciousness. The house has air conditioning hot / cold ducts, wardrobes, parquet flooring, aluminum closures with double glazing and lacquered interior carpentry. The rooms on the top floor, despite having windows, also have skylights in the ceiling that provide them with more light. The interior communal area is open and very bright, with high-quality finishes. The duplex is sold with a parking space of 13.30 m2 in the same building. There is the possibility of buying a second parking space for € 22,000. The building is located right in front of the Hipercor shopping center, 5 minutes walk from the Parc del Migdia, 15 minutes from the train / AVE station and 20 minutes from Plaza Catalunya. The configuration of the building, through the interior patio, facilitates the cross ventilation of the apartment. The double height of the living room and the light staircase give a feeling of spaciousness. The house has air conditioning hot / cold ducts, wardrobes, parquet flooring, aluminum closures with double glazing and lacquered interior carpentry. The rooms on the top floor, despite having windows, also have skylights in the ceiling that provide them with more light. The interior communal area is open and very bright, with high quality finishes. The duplex is sold with a parking space of 13.30 m2 in the same building. There is the possibility of buying a second parking space for € 22,000. It is good thing to find quality and bright spaces before entering the apartment. The combination of the duplex finishes and its lighting make it a modern home. The visual communication between the two storeys increases the sense of spaciousness. Do you want to know more about Míriam Vidal?